This is a communal blog intended to create a space for dialogue between the ODU and greater Norfolk community about the safety and development of our environment. 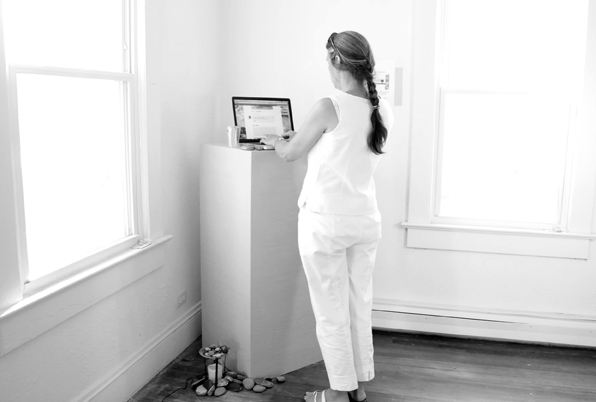 The blog itself, and any changes that manifest from it, is communal work, living poetry. On the day of the ODU Homecoming game, Saturday, October 15, a performance piece of the same name, “a living poem”, was scheduled to take place at the studio from 1 to 1:30 PM. It is not clear yet if this will take place at this time. We will let you know if an alternative location is found. The spirit of this particular performance art is communal presence. All who want to participate are invited to bring a chair or blanket or just sit on the ground. 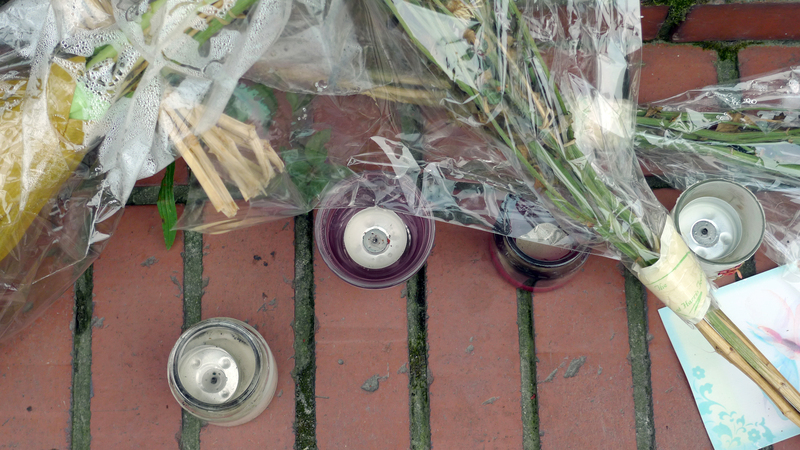 You may also bring a candle in a jar, or an electric candle. It will start with a musical performance. After that, a singing bowl will be played to begin the piece. We will then sit in silence, like listening to a performance of John Cage’s 4:33. We will listen to the ambient sound of the environment, which will be rich with textures. We will sit for a full 10 minutes. This is a long time. You may move or come and go if you wish, you are only asked to respect the silence of the participants. The singing bowl will be played again at the end of the time interval, and the piece will be over. If you are interested in coming, please be a little early. You may also wear white in memory of Christopher and in solidarity with the intention of creating peace in our community. Please see the comment Chris wrote below. 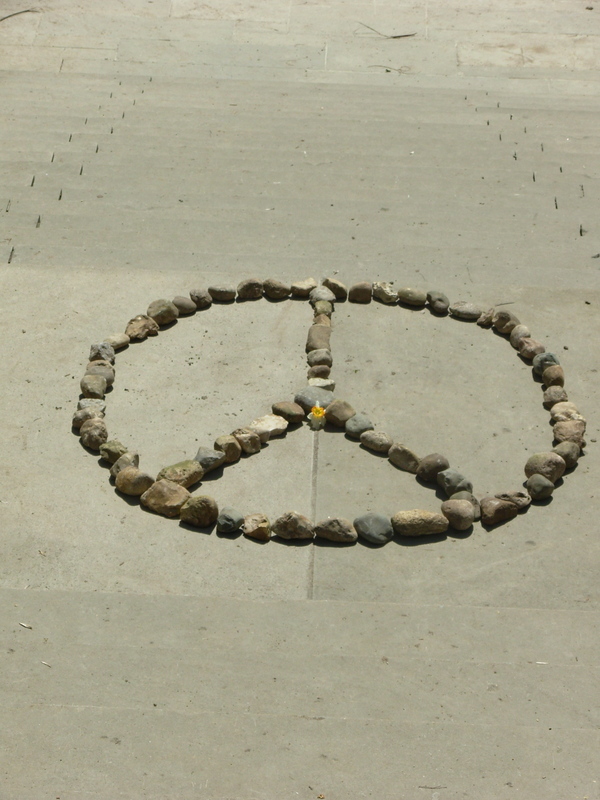 so, when I first saw the peace stones I immediately thought of a picture I took of a similar group of peace stones on the campus of Butler University when iI took my son to Indianapolis for a college visit. It was near a reflecting pond and had a flower in the center. The idea of peace is one we all need to embrace in our hearts first before we can effect peace in our world. We need peace in our relationships, in our families, among our neighbors. We need to learn to walk and talk to one another and form relationships and learn how to love one another and accept each others’ differences and learn the process of peace. It is not a thing but a process. It is not a state of being but a state of becoming… of creating.. it takes work, it takes flexibility, it takes tolerance and understanding… patience and above all LOVE. Indeed as the poster in the room says, it was not mere coincidence that brought us here! This is a very moving piece of art, and we will remember what we saw and read. Thanks Tess for responding and keeping the energy flowing… it only takes a spark to get a fire going, and soon all those around will warm up in its glowing.